Each IBFRA conference focuses on issues of global concern such as global change, biodiversity, climate change, disturbances and the global carbon cycle, as well as on issues requiring increased coordination within the boreal community such as classification, inventory and monitoring. All IBFRA conferences have directly or indirectly contributed to an increased understanding of the science supporting sustainable development in the circumpolar region. Registration is open for the 18 IBFRA conference, Cook Forests at Risk? Please check the conference website for details. We would like to thank everyone who has already submitted an abstract to the cool forests conference 2018. The deadline has been extended to Sunday 10 June 2018. For conference registration fees and further information about the possibility of financial assistance, please check our conference website. Here you will find details of the themes, list of topics, abstract guidelines, and the online form to submit your abstract. The International Boreal Forest Research Association (IBFRA) provides a forum for enhancing information exchange among boreal forest researchers, managers, and policy-makers for over 25 years. The 18th IBFRA Conference for the first time will include mountain forests and other cool forests due to the issues that they share with true boreal forests under changing biophysical and social environments. 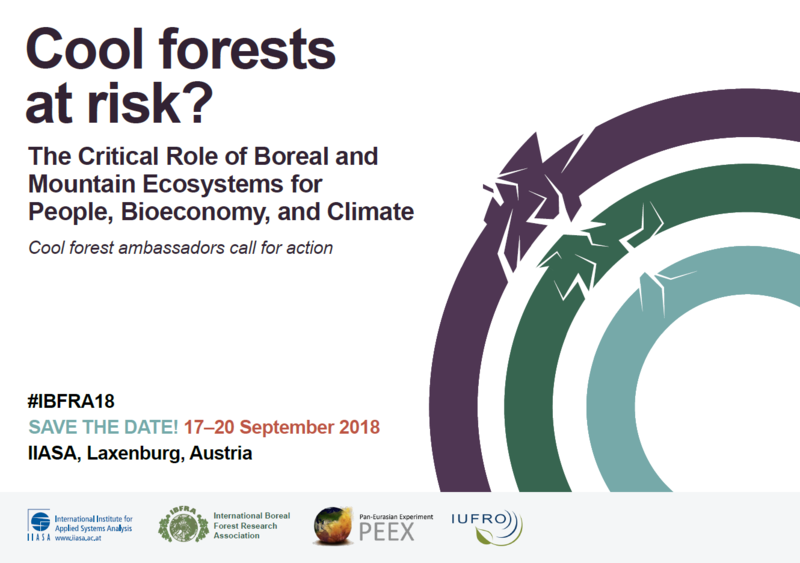 IBFRA18 is a unique opportunity for scientists (particularly early career scientists), professionals, policymakers, public authorities, and civil society stakeholders to share transdisciplinary knowledge and experience within the fields of boreal and mountain ecosystems. We invite any companies and professionals working in the forestry and mountain sector, the pulp and paper industry, tourism, the area of resource efficiency, in new technologies and management, and other fields, to attend and discuss progress on a broad range of forest and mountain ecosystem related topics (see list below). We invite abstract submissions for both oral and poster presentations. Abstracts should contribute to the conference theme (boreal and mountain ecosystems – people, bioeconomy, and climate) and should address one or more of the conference topics. Please visit the conference website for detailed theme descriptions, a list of topics and abstract guidelines, and to submit your abstract. Sessions have been developed based on recommendations and proposals from the Conference Committees and the wider scientific community. Depending on the submitted abstracts adjustments may be made. Please check our website for changes and updates on planned sessions! Selected conference topics – for the full list please see our conference website. For conference registration fees and further information about the possibility of financial assistance, please check our conference website. This conference provides the perfect opportunity to gain visibility in the field of mountain and boreal forest ecosystems and to demonstrate the critical role of your products, services, or activities – for bioeconomy, climate, and people – to a diverse international audience. Please share this message widely. If you have any questions about partnering or participating in IBFRA18 please contact us.